It’s getting towards that time of year where party invites are starting to mount up in my email so I thought it would be the perfect time to share some of my favourite go-to outfits to give you some style inspiration for any Christmas events you may have. 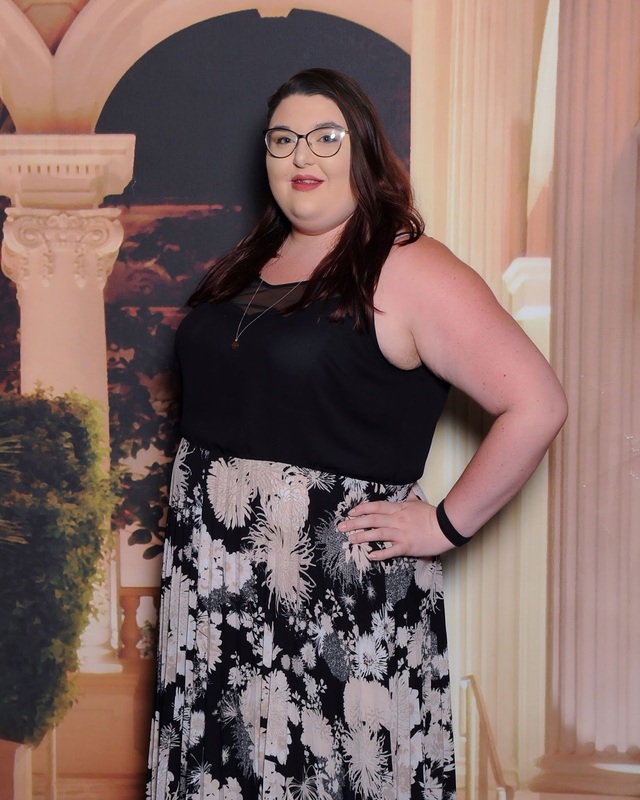 I went through a phase a few years ago where I’d just started to get invited to press events, so every time I got an invite I bought a new dress. However since then my wardrobe has started overflowing with formalwear, so I’ve been making sure I wear what I already own instead of buying new, and some clear favourites have emerged. My first dress of choice comes from a brand that I used to rave about when I first started my blog, but I’ve very quickly gone off of them. I got this sparkly blue A-line dress from Chichi London around two years ago. The brand originally caught my eye because I loved the designs and the dresses were very much affordable by formalwear standards - I think this one was around £65 compared to £150+ that I was seeing on other sites. Chichi Curve has an incredible range of styles that are cut in a way that’s flattering for plus size, rather than simply making larger versions of their “normal” sizes. The designs are more classic than trend-led so if that’s something important to you then you may not love their options, but for me I like to be able to pull dresses out of the wardrobe again and again, so that was what drew me to the brand. However, since I bought this dress a few years ago they’ve barely changed the range at all, meaning there aren’t many dresses that I like on the site and don’t already own. I also found that over the years the quality has dropped somewhat - the last dress I ordered from ChiChi was last year and when it arrived there were a lot of frayed edges that I had to cut away before the zip would work, and the armholes were disproportionately small and I had to unpick and resew them myself before the event. I still love my ChiChi dresses and I would recommend the brand, but take this as a serious warning - DO NOT BUY DIRECTLY FROM CHICHI. On any occasions that I have bought directly from the website the customer service was shocking - the staff were rude, and I had to badger them for three weeks before I got my refund, meaning I went away with £70 less than I should’ve had in my bank. Also, I messaged them on Instagram politely asking why they don’t post more images of their plus size range as it had been months since I’d seen anyone I related to on their feed; in return of my polite criticism I received a very rude and unprofessional response before being blocked. This was last year, so unfortunately I can’t find the screenshot for you anymore, but I was shocked and haven’t bought a ChiChi dress since then as I didn’t want to support the brand. I’m not saying that my terrible experience with them will be an everyday occurrence, but if you do want a ChiChi dress, I would consider buying from somewhere like ASOS or BooHoo to be on the safe side. My next favourite formalwear outfit probably should’ve gone first because I’ve worn this to death since I got it. I had no idea that SimplyBe had shops until I came across one in Lakeside mall in Essex. I went in to do some window shopping, but as soon as I walked through the door I fell in love with this jumpsuit and knew it needed to come home with me. I do find Simply Be to be a bit expensive so it’s very rare I shop with them, and I’d never buy everyday clothes from them, but when you can’t argue that they don’t know how to flatter plus size figures. 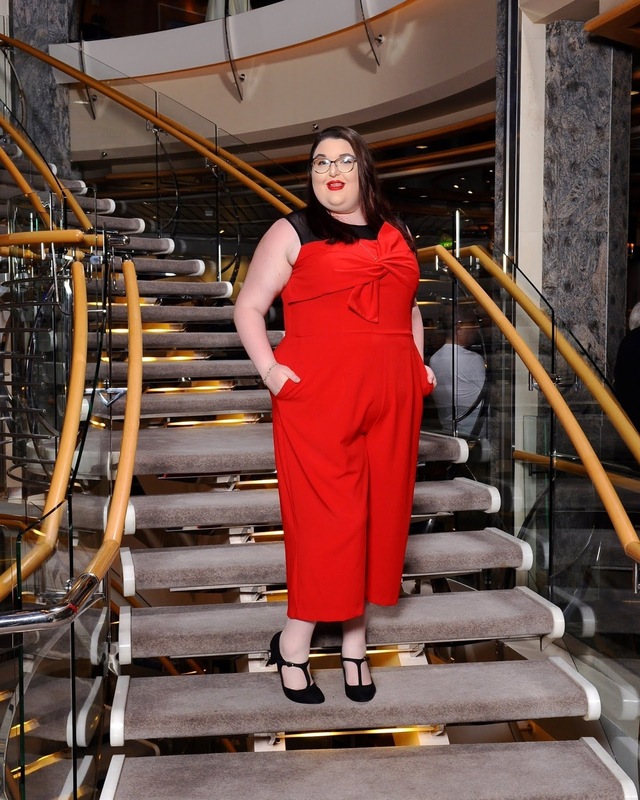 This jumpsuit does everything - the knot on the front draws the eye upwards, the cut glides over any lumps you might not want to show, the length and cut perfectly skirts around everything that you want to show and hides what you don’t, and even better IT HAS POCKETS. Every time I wear this I feel like a Bond villain waiting for her closeup. This jumpsuit was £70 but it was worth every penny. 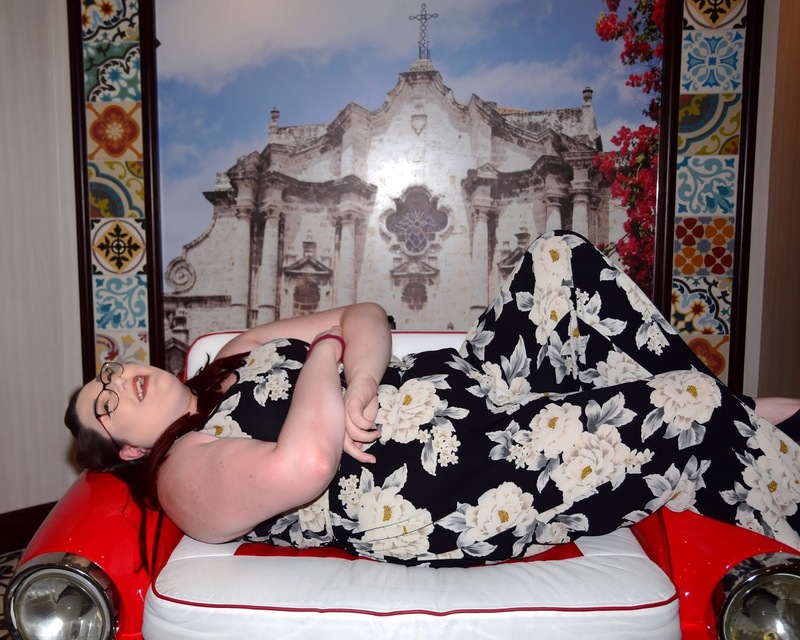 My next dress option is a contender for the most over-worn outfit ever, and this picture perfectly sums up how I feel about this dress. The PR team from Evans kindly gave me this dress for a charity event where you had to wear red two years ago; since that event it’s been to multiple Christmas parties, on three cruises and I graduated it in it, so it’s fair to say that they got plenty of coverage from it. I’d seen the thin Instagram models wearing Self Portrait dresses to death over the last few years and I was always mad that I couldn’t get in on the action, so when I found this dress I knew I needed it. It’s actually from an American brand called City Chic, but it’s sold through Evans, and if I ever go on a cruise to America I’m going to have to take an empty suitcase, a lot of dollars and have a spend up in the nearest City Chic retailer. This dress is everything I want from formalwear - it’s elegant, comfortable, timeless, my favourite colour of clothing and it’s the most flattering dress for plus size bodies. The only thing it’s missing is pockets. I’m not sure how much this dress was as it was a gift, but I loved it so much that I then hunted for somewhere to buy the navy blue version of this, and from what I saw I’d guess it’s around £80-£100, but if you’re really desperate for this dress, they do ship internationally but it’d cost around £120. Next up, I wanted to give you a few options for less formal occasions as I know not all events are black tie. I actually put this outfit together for a party while I was on board Independence of the Seas where the theme was bright and colourful - I decided to go all out thinking it would clash in a good way, but I ended up absolutely loving this outfit and wore it for a second time on the final night (fun fact, I wouldn’t recommend the shoes from Peacocks, as on my way back to the cabin one of the heels snapped and I ended up on the floor in the middle of the corridor!). Even though I was dressing to a theme that night, I would definitely wear this to a Christmas party. 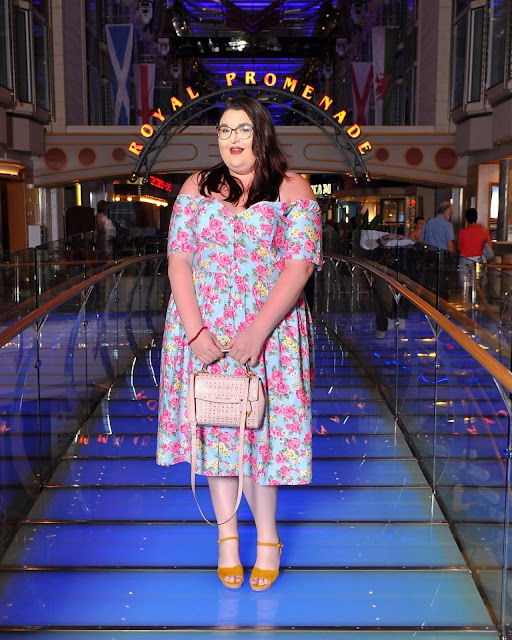 I got the dress in the end-of-Summer sale on ASOS for around £16, and it’s one of the most flattering things I own, even managing to hide all the lumps and bumps after two weeks of rich food and unlimited sugar-filled cocktails aboard a floating palace. Overall, I find ASOS to be a little hit and miss with their plus size offering. I love the fact that the pieces are usually trend-led because I feel like as plus size women we’re often expected to wear a navy blue or black sack and just be happy that it goes over our hips. The sizing on ASOS can be a little weird though - I usually find that the clothes that are plus size exclusives are cut incredibly well for our kind of figure, but then you order something that’s available across all ranges and they’ve just taken a “normal” size and made it bigger, and any thought of tailoring for curves has gone out the window. I would absolutely recommend ASOS for formalwear, but if you’re in a time crunch or you fall in love with something in the sale I’d make sure that you order two sizes just to be sure. Continuing on the more casual vein, I wanted to award this gorgeous midi-dress an honourable mention. I actually ordered this from the Simply Be outlet on eBay; if you didn’t already know it existed, it’s basically what’s leftover from the sales that Simply Be has on their site, and they put the odd leftover sizes on eBay. It’s an absolute treasure trove and it makes the usually super expensive site much more affordable. 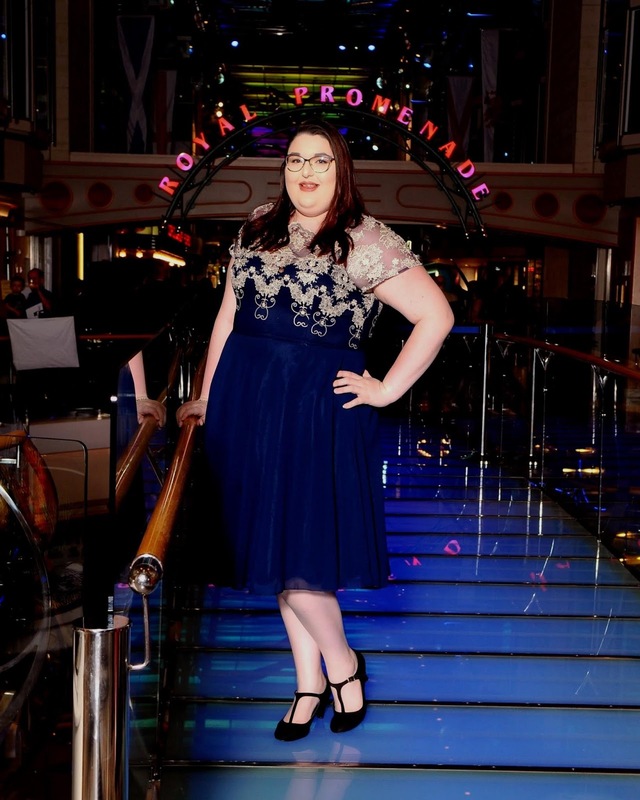 I bought this dress just before the cruise thinking I’d wear it as something easy to throw over a swimsuit on port days, but when it arrived it was more formal then expected so I ended up wearing it for dinner on smart-casual evenings aboard the ship. From memory this dress cost around £18 and it was worth every penny! For my final option I wanted to go for something a lot less formal - for me I love dressing up so this is the kind of thing I would wear to dinner with family or for a few cocktails with the girls, but I know that not everyone has a Mary Poppins wardrobe full of formalwear, and not everyone enjoys having to wear something more formal. This top came from Yours Clothing last year - they only had one size which was way too big for me and I loved it that much that I ordered it, then hand stitched it to make it slightly smaller. It’s still very big on me but I love the fact that the choker neckline doesn’t actually choke me, and the heavy fabric glides over everything meaning it’s great to wear if you know you’re going to end up with a bit of a food baby that evening. I do find Yours Clothing to sometimes be a little “Mumsy” at times so it’s definitely best to try things on if you can, but every so often you stumble across an absolute gem that never quite makes it back to the wardrobe because you wear it so often. Yours Clothing isn’t the cheapest place to shop ever (tops average around £30 each) and for that money I think the quality could be better, but it’s definitely somewhere on my mental list of websites to visit when I’m looking at sales or what’s new for this season. Honestly I could talk about my favourite formal/semi-formal outfits all night - I love getting dressed up and I’m lucky that I get quite a few chances to indulge. For now I’ll leave you with this absolute gem of a photo from my time on the ship - who said blogging isn’t hard work?! 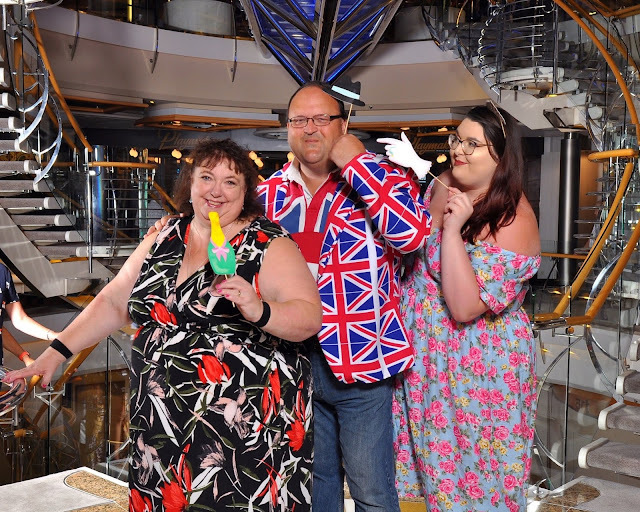 I also have to say a massive thank you to the amazing photographers I met on the last cruise as they were always happy to document my outfits for me - even when I’d changed outfits multiple times in one day! 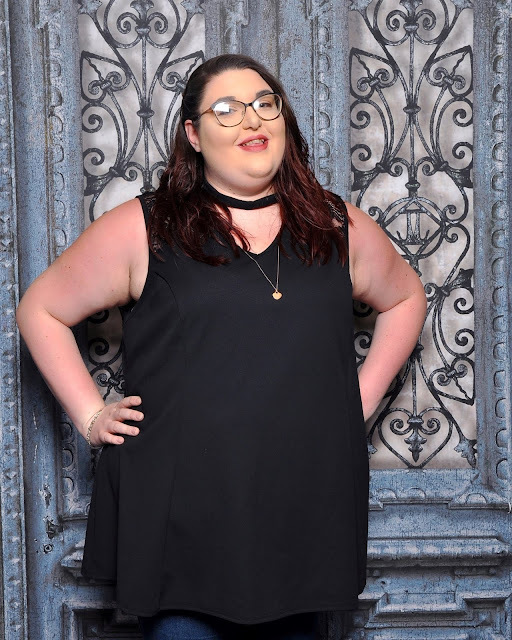 I really enjoyed putting this post together so let me know if you’d like a part two because I definitely have more outfits to share with you. Do you like formal wear or do you hate dress codes all together? Let me know in the comments below! Have your say; it's a hoot! I'm Becky; a 20-something writer, photographer, radio presenter and travel addict with a particular love of cruise ships. Inspired by owls, sunflowers and positivity, I write about everything from where I've been and what I did there to how to make the most out of your trip, with a little bit of everything else thrown in too. What Do You Want to Read?